Keeping in touch with your mom and dad is vital for your emotional wellbeing, and the frequency of your contact with your family members will impact and determine the quality of your relationships. When it comes to reminders to call mom, there's some things that you can do to make it easier to remember to call your mom on a regular basis. By establishing those habits of regularly calling or messaging your parents, then they are more likely to reciprocate and call you more frequently as well. Through my own use of the tool that I built, Keep My Friends, I've found that after a few weeks of regularly contacting my friends, then they've initiated contact with me more as well. I'd missed a deadline to contact one of my friends that I have on a 7 day contact cycle, and they reached out to me to say "for some reason I was thinking of you today", because of the habit and association that Monday had with speaking to me each week. 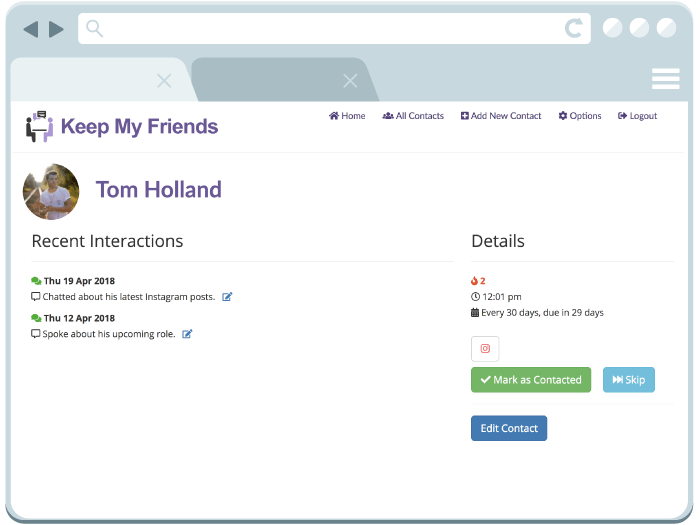 Keep My Friends has been built to make it easy for you to keep track when you last spoke to your mom or dad and your friends. For each person you add, you can set the "Contact Frequency" - or in other words, how many days is the maximum that you want to allow it to go between times that you speak to them. 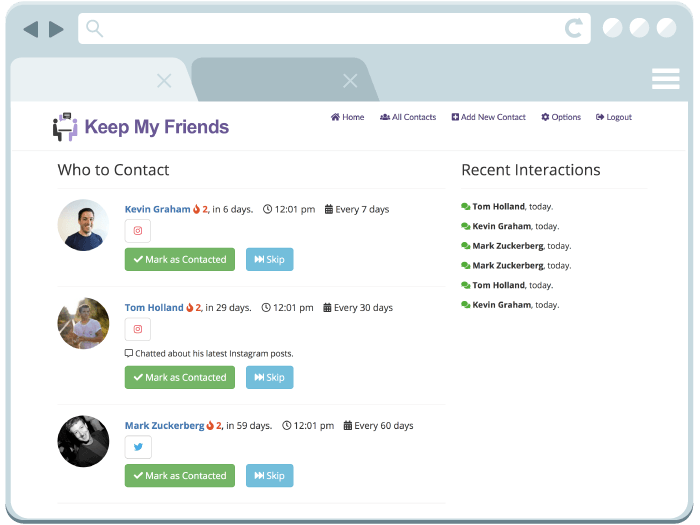 Simply login to the web site, and click "Today" when you speak to one of your friends and it will update your records. Keep My Friends also includes daily email reminders if you're overdue on calling your mother, at a time of the day that best suits you. For me, the email comes at 9 am every day to let me know who I should be reaching out to on that day. You can see a screenshot of what the web site looks like below. Now, the only other question that might be on your mind is how much does this service cost? You'll be pleasantly surprised to find out that it costs less than the price of a cup of coffee to get monthly access to this service. Keep My Friends is priced at the extremely affordable price of $7.89/month with a 14 day free trial to get you started. I built Keep My Friends with the purpose of improving my own relationships with my friends and family members and it's been extremely useful for that. And I wanted to share the benefits I've been able to get from this tool with others, and make it so affordably priced that you didn't have to think twice about joining - so that's why it's just $7.89 a month to use it. If you're looking for a way to remind you to call mom or dad, there's nothing better that I can think of than Keep My Friends. Start your 14 day free trial today! How do I add a Profile Image for My Contacts? Keep My Friends makes it easy to remember to call or message your friends and family on a regular basis. Join Today! 14 day free trial, then just $7.89/mth.